Volume 6, Issue 3: Joy of Sox - The World Series, 'nomes, the NFL and Toronto! 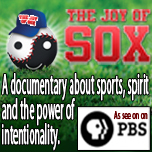 Lots of interesting stuff in today's newsletter and let's send some mojo to our Red Sox! The JoS Joy in Toronto - Rick had a presentation on "Group Energies in Sports" at the 15th Annual Conference for Integrative and Energy Therapies in Toronto on Sunday, October 27. You can learn a little more about what these presentations are at this link: Epccanada.ca. Be sure to watch the World Series and send the Sox some mojo. Or any other team that you love!